Bungalow Style, popular 1900 -1930s, from the Shingle Style homes of the decade before. Modified hip roof with dormers, classic style front porch. This six room cottage was built by William M. Wood for the use of his Chauffeur and family. Andover assessor’s records state a date of construction of about 1905. The Andover 1910 and 1920 Valuation records list only three houses on this side of North Main St.; #269, #275, & #279. 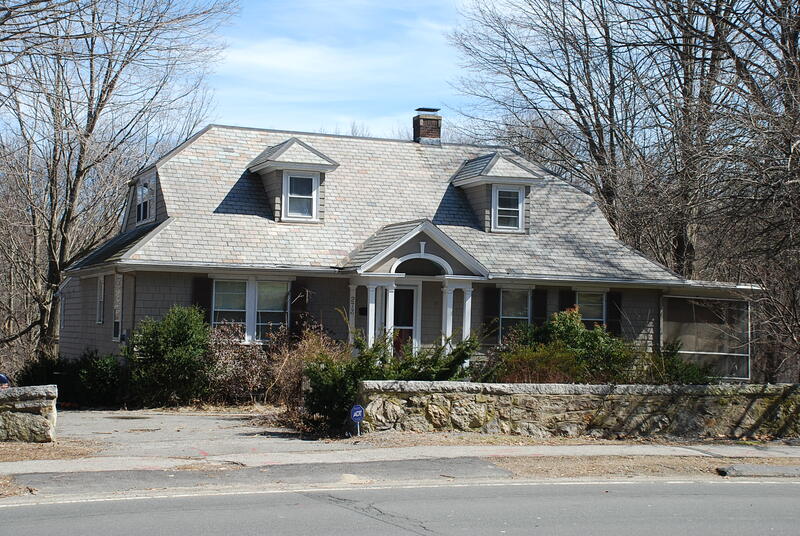 This home was most likely built in 1920 during the construction of Shawsheen Village. Joseph Beaulieu chauffeur is at #273 in 1923. The house was part of the Arden Trust property established in February 1921 for the children of Mr. & Mrs. Wm. M. Wood. Son Cornelius A. Wood was a Trustee. After William Wood’s death in 1926 the Trust assets were transferred to the Phillips Corporation of Maine to liquidate the trust property. Joseph & Julia (Kennedy) Beaulieu became the owners of the home. Joseph Beaulieu became the personal chauffeur of William M. Wood about 1922. Joseph was born in Wolfton, Quebec, Canada in 1905, son of George & Caroline (Therrian) Beaulieu. His father was Canadian and his mother was born in New Hampshire. Joseph and Julia Beaulieu lived in this home in 1923. They had one son William J. Beaulieu born in 1923. Joseph Beaulieu and “Arden” caretaker August Frederickson had accompanied Mr. Wood to Florida for his winter vacation in 1926. Both men were with Mr. Wood the day he died on February 2, 1926 at Daytona Beach. Joseph continued to work for the Wood family for many years retiring as a private chauffeur 1961. Julia died at age 68 on October 28, 1959. She was the daughter of Patrick & Katherine (McKenna) Kennedy both of Ireland. Joseph died a tragic death in a house fire on October 24, 1965. Joseph & Julia were members of St. Augustine’s Church and are interred at Immaculate Conception Cemetery, Lawrence, MA. Their son William J. Beaulieu and his wife Jean inherited the property. Jean was a beloved kindergarten teacher with the Andover Public School system. William and Jean lived here for a short time and then rented out the house. Harriette E. Shinnick and daughter Mary R. Shinnick a school principal rented in 1970. The home was then sold to William G. & Dorothy Piercy in November 1971. Piercy owned a bus transportation company, “chauffeuring” school children. His wife Dorothy is remembered by many townies, as the artist who painted the mural of Main Street in the 1950’s that hung in Ford’s Coffee shop. Now owned by the Andover Historical Society, the mural is on permanent display in the Town Office Building on Bartlet Street. Dot also painted a companion mural 40 years later which also hangs nearby. The Piercy’s owned the home for nearly 30 years before selling to sisters Katey & Kim Regan, trustees of the 273 North Main Nominee Trust. They held the property for two years from 2000–2002 selling to Christopher & Deanna Pierpan in November 2002. Four years later Edward Wallace & Pamela Falk purchased the property and are the current owners in 2013. Major Alterations 1965 Fire gutted interior - rebuilt and remodeled interior.